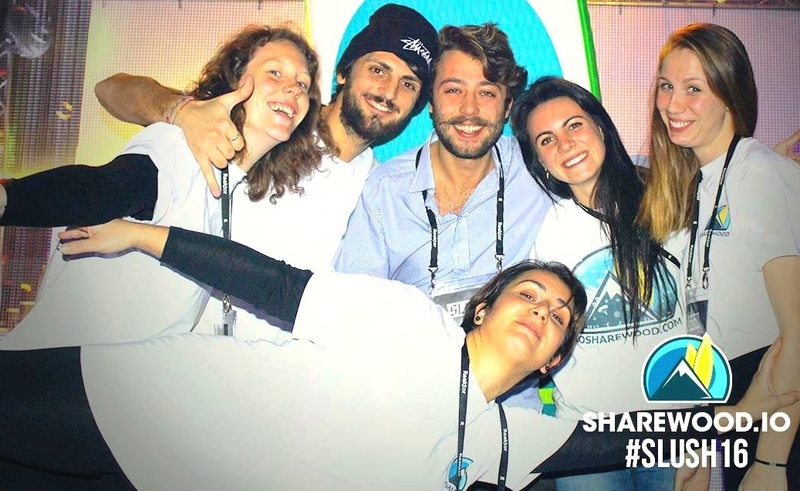 Sharewood the startup in the travelling and experiential tourism has achieved an important goal. To become a Tour Operator. The team has always promoted, supported and aggregated international adventure travellers. With outdoor sports activities. The platform that connects sports travelers and their equipment, launches its challenge to the world of travel. This is based on three key points: groups, itineraries and tailor-made proposals combined with the possibility of packaging and selling experiences in travel agencies. Sharewood spokeswoman says: "Becoming a Tour Operator is a challenge we have chosen to enhance our skills and know-how. We are responding with flexibility and innovation to the demands of our community." 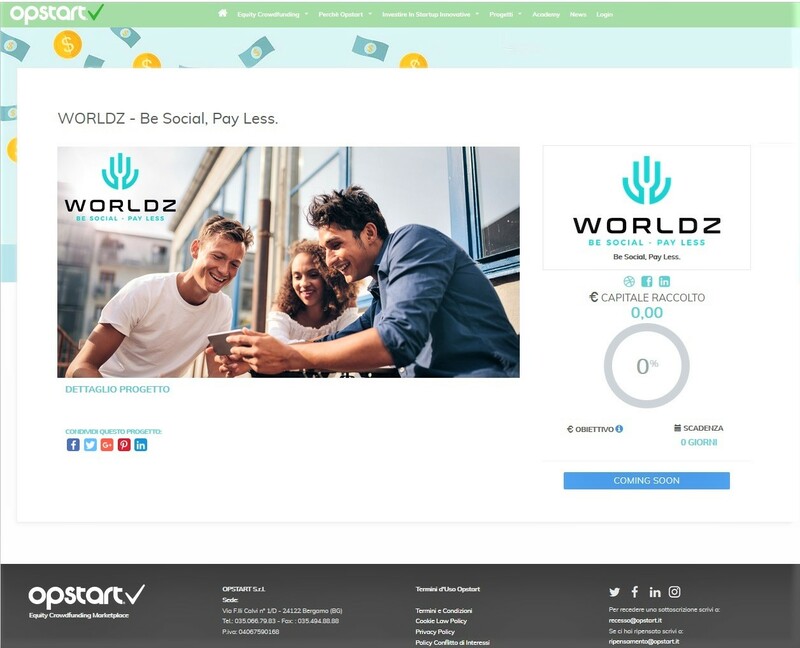 Worldz the startup in social sharing and digital marketing has completed the round of equity crowdfunding, and 4 days ahead of the deadline. The campaign is now at well over 100% and going into overfunding. If you are interested in this Italian startup, time is quickly running out. Your chance to be part of Worldz and the digital revolution. The link to the campaign is here. The Social Lender reinforces its company structure with new associates who're contributing with know-how, expertise and funds. The company has also appointed a board of directors. The first new associate is a company, Geo Investments represented by Francesco Colucci, who specializes in the listing of companies, structured financing and asset management. The second new associate is a well known Milanese Chartered Accountants office, which specializes in corporate affairs and deal structuring. 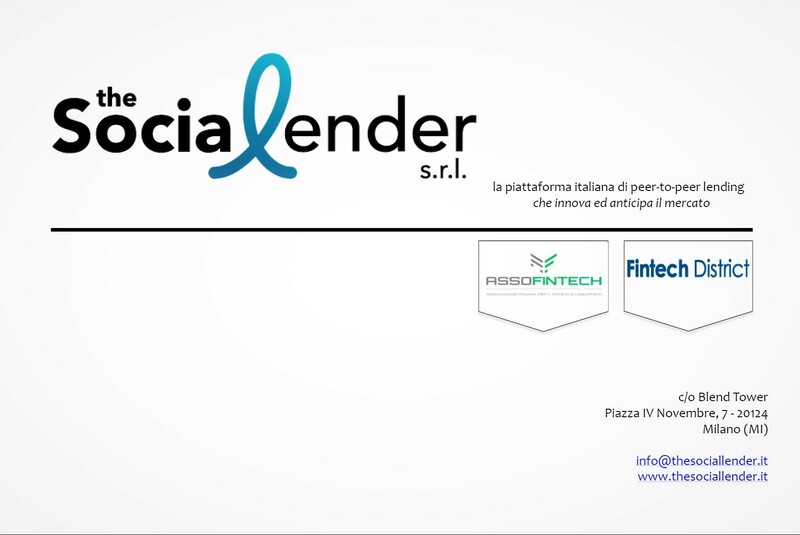 With the new expertise and capital increase, The Social Lender is preparing for significant growth, and is thus moving its headquarters to the Fintech District in Milan. More information about the new company structure here. Message to all the Worldz fans! End of January is the official start of the equity crowdfunding campaign you have all been waiting for. You can now be a co-owner of the digital startup Worldz. But when the campaign opens (end of January) you should be ready, we expect that it will sell out quite quickly. Worldz has thousands of followers and supporters. The teaser page on the Opstart platform meanwhile is up and running, if you want to have a look follow the Link. Worldz is a startup accelerated by LAB Creative Thinking. TocTocBox® has a new website for the enjoyment of a multidevice service. 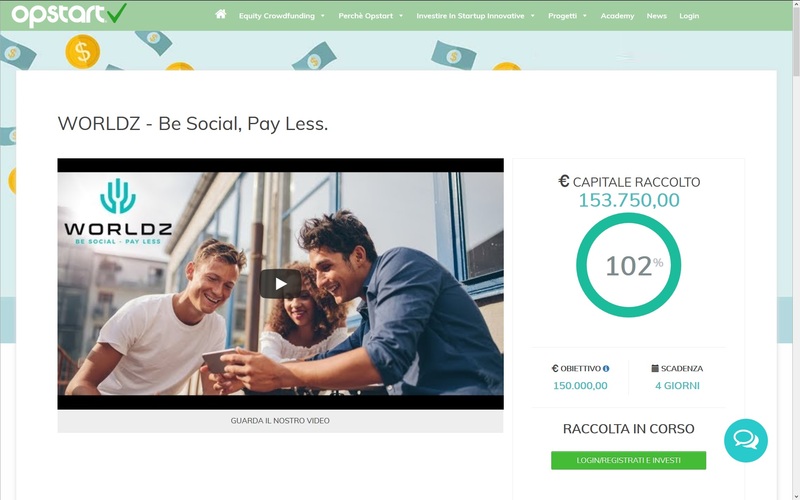 One of the first innovative startups in Italy to launch the campaign on CrowdFundMe by collecting € 95,000, is redesigning and evolving its site. The typical sharing economy service launches a new website that significantly improves usage experience. An additional lever to allow so many users to easily ship their belongings through the help of so many travelers who are now part of the first TocTocBox sharing community. The new Toctocbox.com comes with a clear visual and impact that is consistent with brand look & feel. A new service content and an immediate home page that allows users to explore with a few clicks the search for items. For travelers to find items to be sent, or to enter a travel ad. For those wanting to ship an opportunity to send goods and important objects with a trusted community member. The website allows you to enter a shipping ad and to find your ideal traveler. 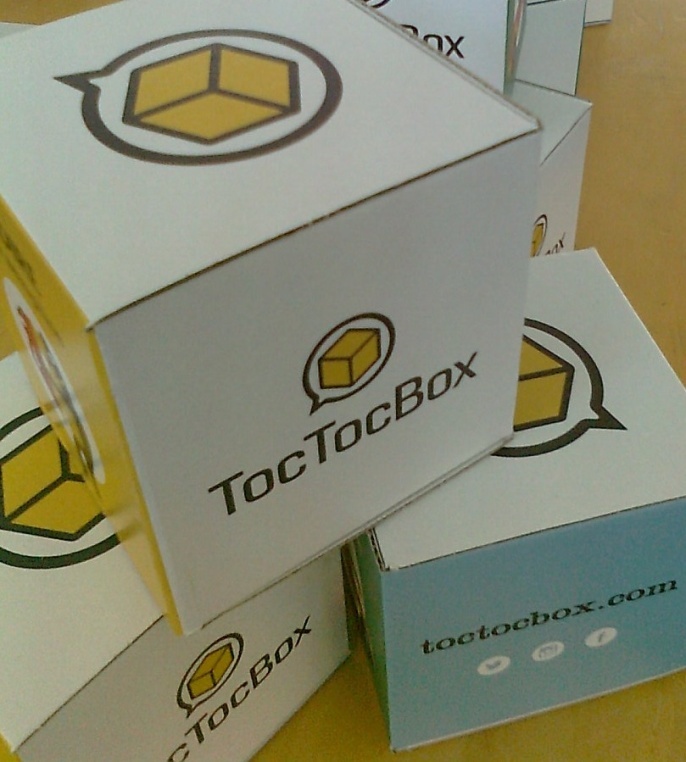 Creative Thinking Ventures is seed investor in TocTocBox. 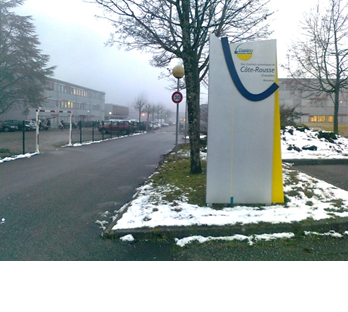 Netcomm, the Italian Electronic Commerce Consortium, the reference point for e-commerce in Italy, and internationally. This is a key partnership for the startup Worldz. On June 22 and 23 the fifth edition of Crazy Web Shopping takes place. A 30 hours, non-stop, online purchase event with discounts of up to 80%. It works as follows: in a set time frame, consumers will gain access to highly affordable and exclusive shopping opportunities by hundreds of qualified ecommerce stores. 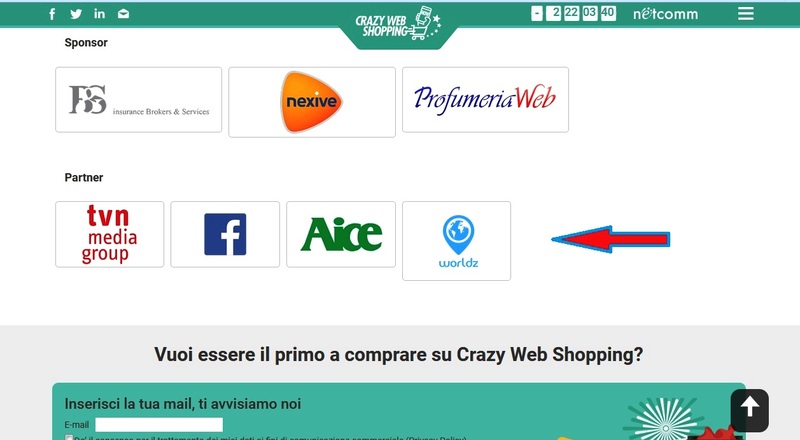 Worldz has now become media partner of the Crazy Web Shopping initiative (see screen shot). The next edition is tomorrow, and will be held on www.crazywebshopping.it starting at 12:00 on June 22, and finishing at 18:00 on June 23. Want to know more about Worldz? Follow this link. If you need investment information, please follow this link to Worldz' founding investor. Sharewood wins the Millennial Traveller at #M2020 ! 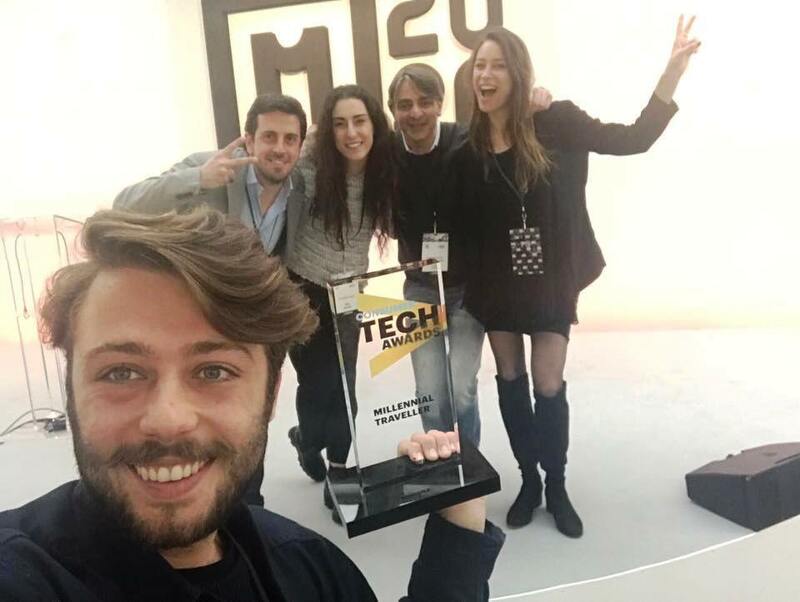 Piercarlo Mansueto, the CEO of startup Sharewood does it again, and wins the Travel & Hospitality category finals at the Millennial 20/20 Summit in London, at the Old Truman Brewery. With the presence and support of Danilo Mazzara. Great Job. 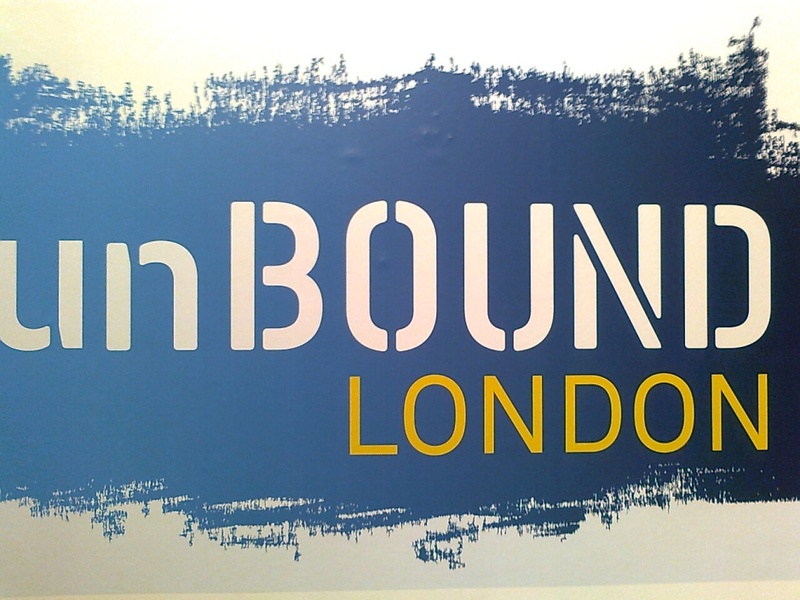 This event is promoted by Accenture Travel, Forbes, CNBC, The Economist and Samsung. Also in the finals were Conichi and Esplorio. 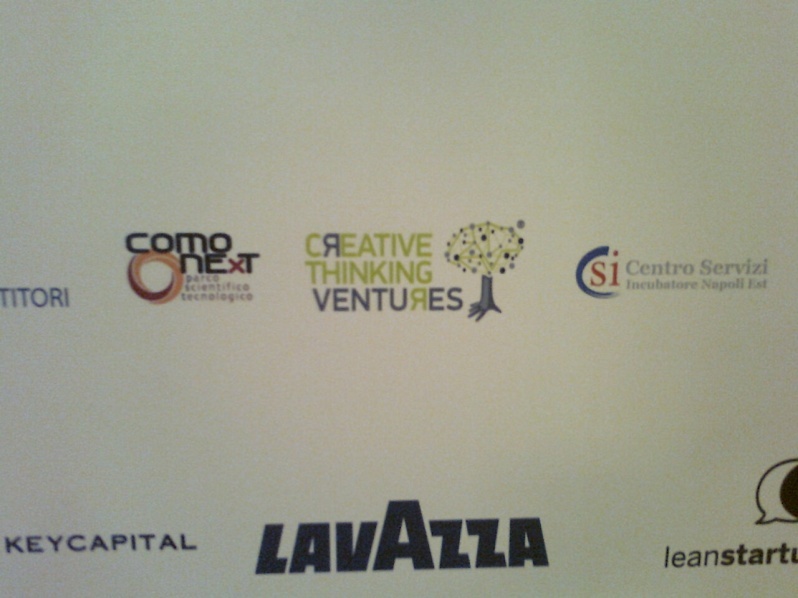 Creative Thinking Ventures is founding investor in Sharewood. 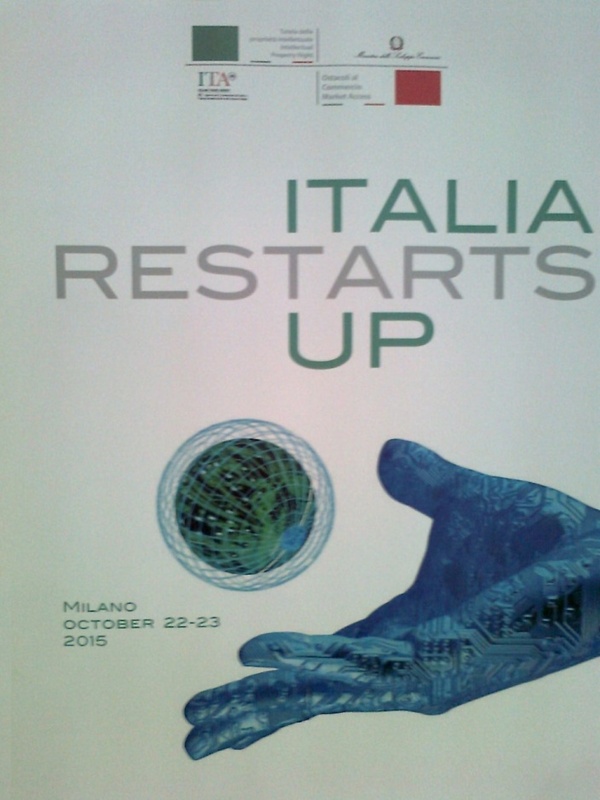 Worldz at Made in Italy 2.0.2.0. by iStarter in London. The event has been organised by iStarter, founded by Simone Cimminelli; it is the Italian angels-led accelerator in London. 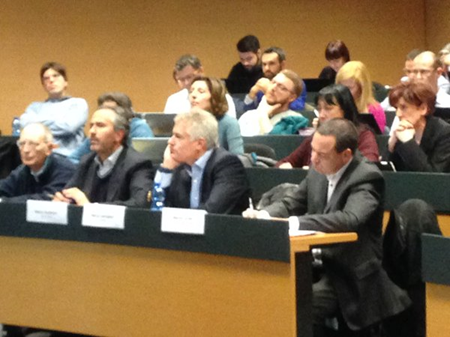 They select the most innovative Italian startups and help them to scale globally. Each year iStarter selects digital startups lead by Italian entrepreneurs who have achieved remarkable metrics, and presents them to an audience of international investors. 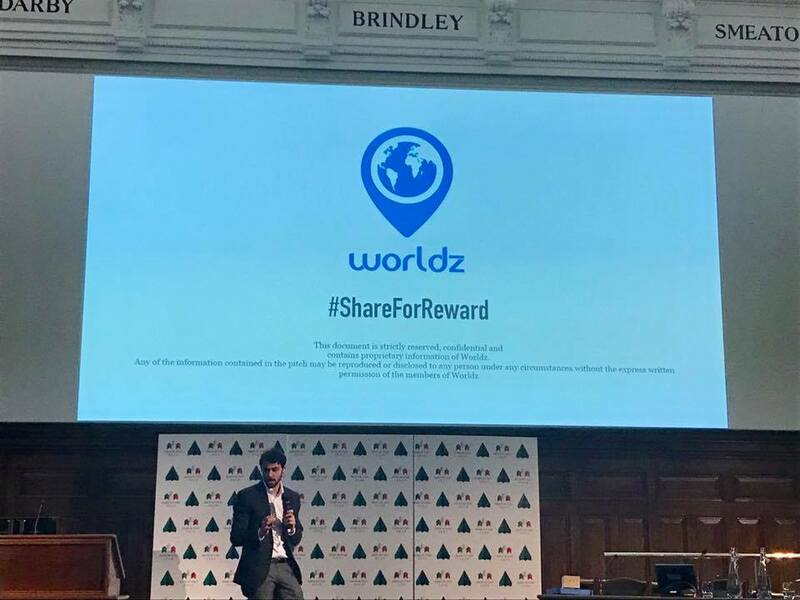 Worldz has been selected to participate to this important event in London, in Westminster in the afternoon and an evening with investors in the Houses of Parliament. Joshua Priore has pitched in front of 200 investors and venture capital funds, London based and international. Worldz is a tool for e-commerce which understands Facebook users popularity, giving them an economic value. This value will be used as a daily discount for their purchases on Worldz ecommerce partners. When customers do purchases they have to share the post on Facebook to get the discounts. This makes ecommerce cooler than before. Users will play with the theory of WOMM (word of mouth marketing) to increase e-commerce impact and conversions! CLOSED with SUCCESS! The Sharewood crowdfunding campaign. Sharewood's crowdfunding campaign has been hugely successful with an overfunding of 300% and 160+ investors, who trust the team and the business. This number of investors is an absolute record for Italy, in a single crowdfunding campaign. Sharewood is a large community of outdoor sports enthusiasts who exchange equipment, information and a true passion for sport. Today this campaign closes, after which you will have 5 days to send the funds for your equity investment by bank transfer to CrowdFundME. But today it is really the last chance, to be part of the Sharewood startup success story, at the current valuation of €3mio. 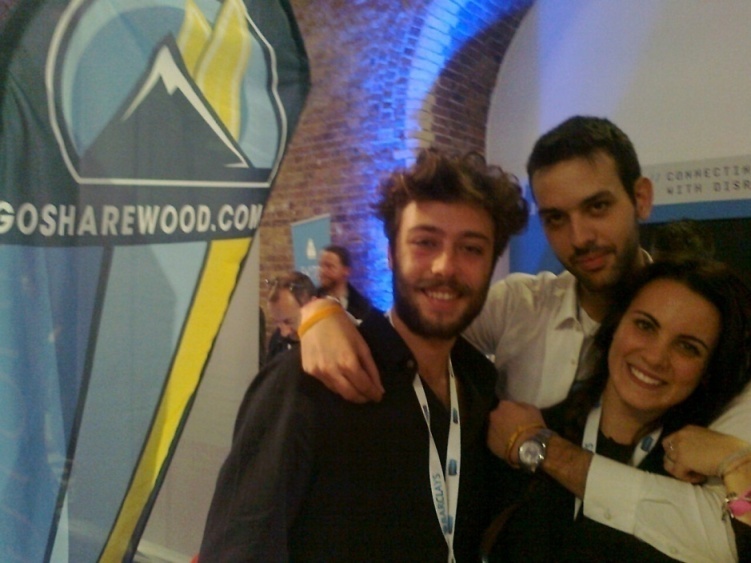 Founder and CEO of Sharewood is Piercarlo Mansueto. At the centre of the picture. Co-founder is Giulia Trombin, on his left in the picture. Sharewood has a cohesive team of 12 members who are all outdoor sports practitioners. In the picture we see part of the team at #Slush16, while they were in Finland at the Vertical Health and Sports Accelerator. Creative Thinking Ventures is founding investor in Sharewood and our CEO Marnix Groet is board member and advisor for Sharewood. Milan, February 8, 2017: after the success on social networks, taken up by web agencies of the caliber of StartupItalia!, AGI, and the RAI, today Worldz makes headlines with the closing of a private round of financing of € 150k. The startup, which has been "live" for several months, with a service that accelerates the activity of eCommerces through the sharing of purchases on social networks, has concluded a number of contracts with corporate customers in recent months. 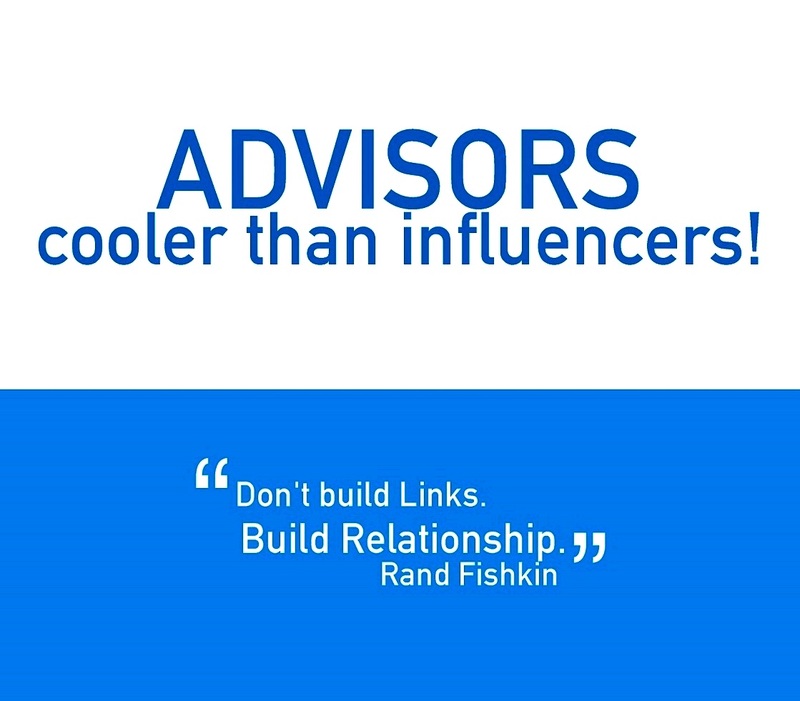 Ready, therefore, to scale and validate the initial metrics, which are very positive, and to make each of us a mini-influencer or advisor in our community of friends and acquaintances, and thus monetizing our social value. 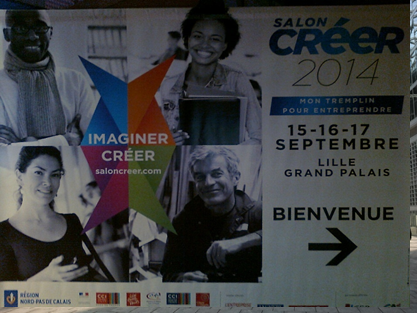 Creative Thinking Ventures is a French fund of micro venture capital, which operates in the pre-seed stage of the life of startups, and accompanying them with mentoring and advisory services. The aim is to overcome the "valley of death", achieve growth and validation of the market, and the closure of a round of financing. The plugin is installed on various e-commerce sites, and with the updated metrics, it's now time to raise funds and scale the business. The founder, Joshua Priore wants to expand his team with Senior Managers / Angel Investors (so called Business Angels), who can contribute €€€, and possibly, with the right skills, also W4E (work for equity). You think you have the right skillset? With experience in selling software and management of digital products or high-level negotiation skills in B2B, please get in touch directly on the website of Worldz, or just now, on this site. Worldz is making headlines, of the top Italian web information sites like StartupItalia!, Ninja Marketing and Facciamo Impresa, and newspapers like Eco di Bergamo, Il Resto del Carlino, or broadcasting stations like Radio Kaos, Radio1 Rai, etc. etc. The Worldz model, based on measuring your influence, sharing your purchases and advising your network is explained in this informative article, just published on "Che Storie", the website about startups, the web, innovation, and much more. Startup Sharewood reaches 100% funding for the crowdfunding campaign on CrowdFundME. 3 days in advance of the scheduled date, the campaign has been successfully completed, with a significant overfunding. 50+ investors have confirmed that they believe in Sharewood's business model, and that they trust the team to scale-up. Sharewood's team accepts a reasonable level of overfunding, so, the campaign is, for now, still open to additional investments and newcomers. Sharewood is the leading European peer-to-peer social marketplace and network that enables people to list or rent outdoor equipment for snow sport, water sport and biking. The acceleration programme in Vertical has now been completed. Excellent result for Sharewood on CrowdFundME. More than 50 investors have confirmed their trust in the startup. 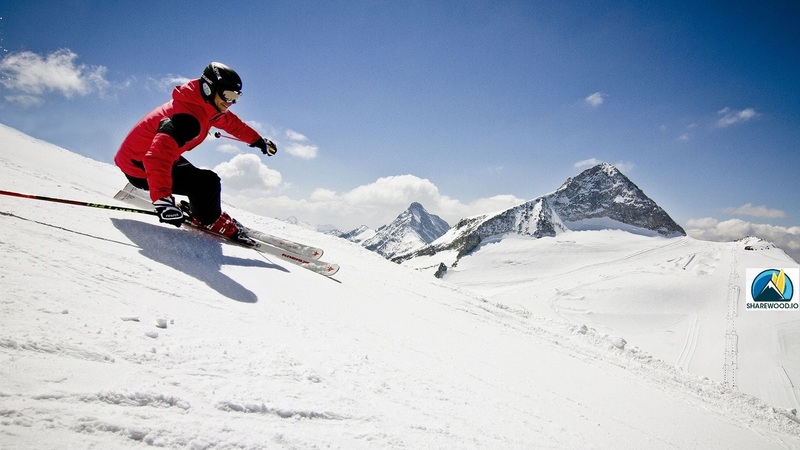 Sharewood is the leading European peer-to-peer social marketplace and network, that enables people to list or rent outdoor equipment for snow sport, water sport and biking. 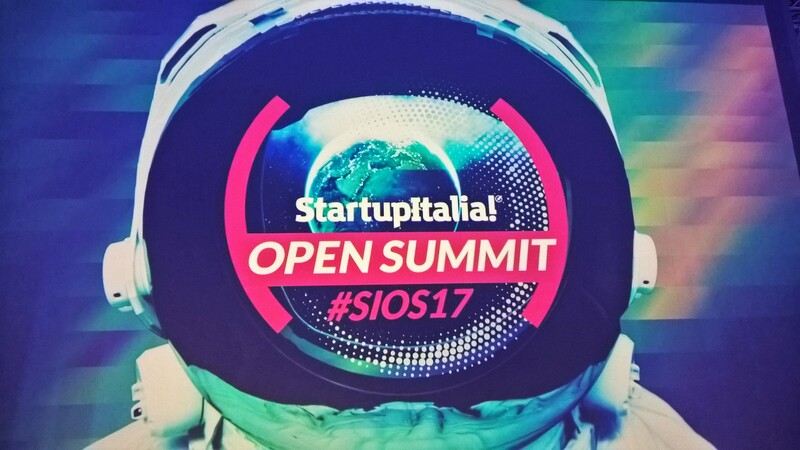 The startup has won the first edition of Startup Italian Open at #BTO2016 Buy Tourism Online. And this has certainly been instrumental in gaining even more attention of the investors. Currently accelerated in Vertical, Sharewood is scaling-up to the next round of investment. Once the crowdfunding campaign is completed. In May 2017 the timimg should be right as the prize the team has won, participating at the PhocusWright Europe conference in Amsterdam, will be a great chance to get noticed internationally. The platform for crowdfunding, CrowdFundME, has shown, again, that it is the right means for startups to finance their growth. +50% funding reached! Milestone for Sharewood. The crowdfunding campaign on CrowdFundMe is working out well for Sharewood. Well over 50% was an important achievement in this fundraising activity to finance the growth of Sharewood. The team led by Piercarlo Mansueto is actively supporting the campaign with on and offline marketing and promotional activity. 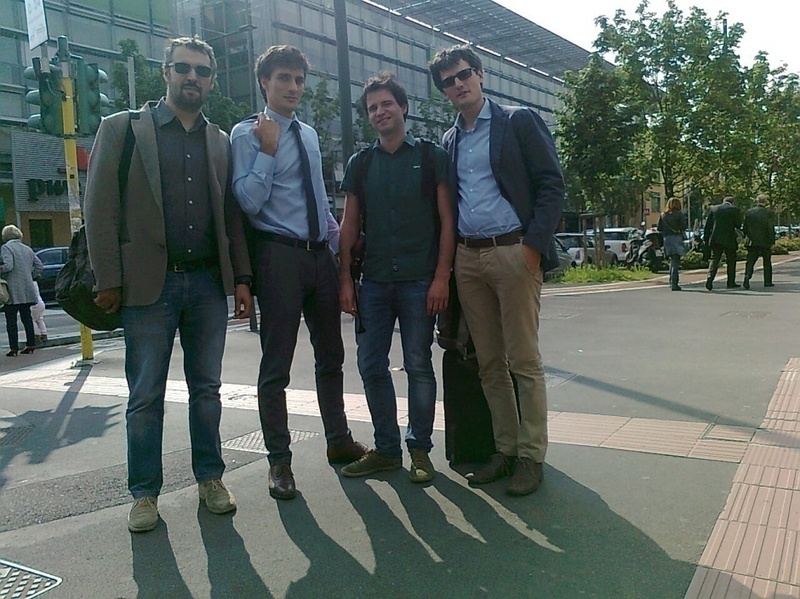 As is also the crowdfunding platform CrowdFundMe, managed by Tommaso Baldissera Pacchetti. Thanks to the 32 new investors who are already supporting Sharewood. There are still a few weeks left to join this campaign, which is probably going to be widely in overfunding. www.toctocbox.com has been until November 8 on the Eppela reward crowdfunding platform. The campaign started on September 29 and lasted for 40 days to find supporters and contributors for this sharing economy startup, which offers an essential service to the whole community. b) support, on a more continuous basis, the massive dissemination of the service through expansion of the community of users, this is required to improve the service itself. For more information go to www.eppela.com in the section projects. TocTocBox is the first collaborative platform that connects those who want to send with those who travel. To offer a service which is beneficial and reliable. So, shipping is made easier with verified travelers, and, also, traveling becomes more affordable, by covering part of your expenses. 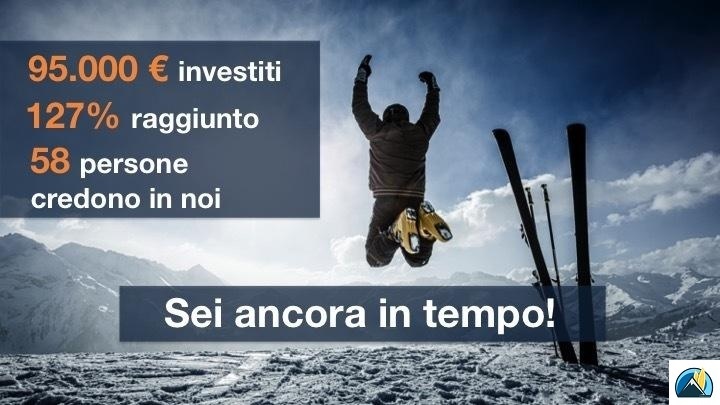 Sharewood is equity crowdfunding on the top Italian CrowdFundMe platform. This is a great chance to become part of this cohesive outdoor sports community! As a co-owner of this promising startup. 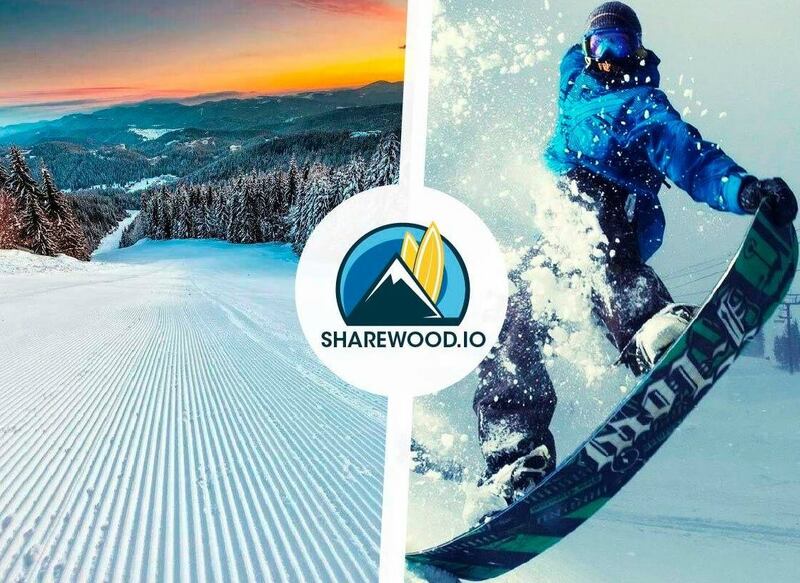 www.gosharewood.com is the first peer-to-peer platform in Europe that connects the owners of sports equipment such as bikes, skis, surfboards, with travelers interested in renting them. The rental market of sports equipment has long existed, but the approach of Sharewood is totally new: linking, easily and simply, people who until now had difficulty to meet. The rental process is quick and easy. Found the required category of equipment, and entered the place of withdrawal, in a few clicks you can choose between the various products, submit your request to the owners and complete the process with the payment. On the other hand, for sports equipment owners, Sharewood is a very simple way to access an additional source of income, transforming equipment accumulated over the years in an economic value and revenue. 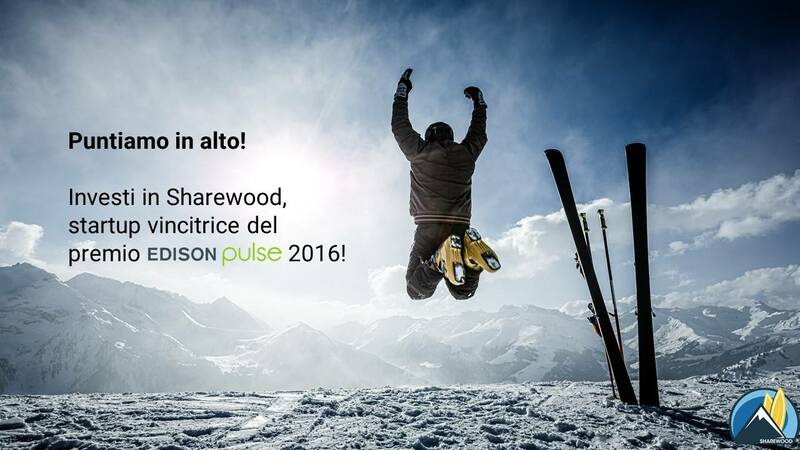 Sharewood wins the Edison Pulse competition #IW16, organized with StartupItalia and presented by Arcangelo Rocciola and Riccardo Luna. Supported by David Casalini. Piercarlo Mansueto did a convincing pitch to the qualified jury and explained the reasons for the success of the startup in outdoor sports. Developing an living community of active enthusiasts. 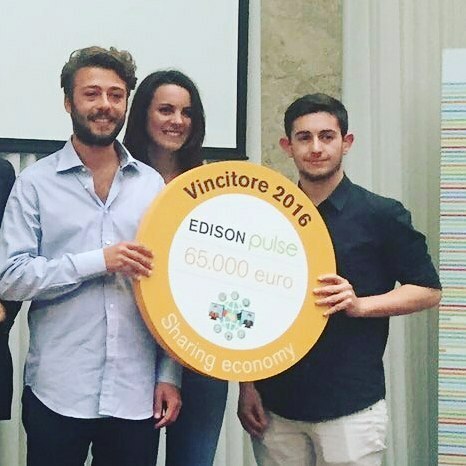 In the picture Piercarlo, Giulia Trombin and Andrea Panzeri holding the prize they just received. The service offered is typical of the sharing economy, and responds to a real need, and has popularity with sports practitioners, and Italian and foreign tourists. Who want to pick up their equipment directly in Italy, while on holiday. 50% of users are Italian while the other 50% of users come from abroad. InnoVits Gymnasium is a "gym" for the development of start-ups, in which a team of mentors and tutors with professional experience in different fields, and certified by InnoVits Academy, follows promising new companies, in an accelerated path that applies and develops business ideas, according to a structured program. 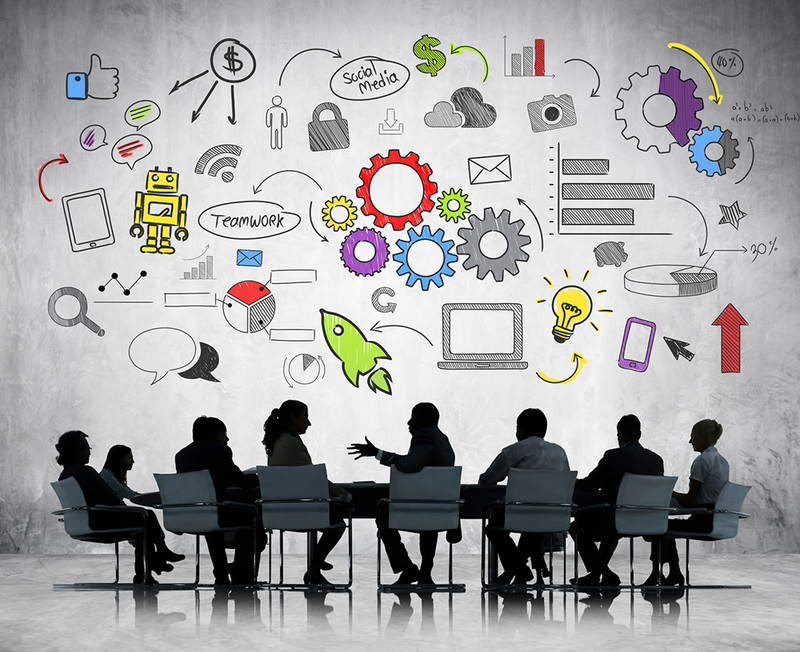 In collaboration with MIP, InnoVits helps to spread the culture of innovation through an experiential approach, with the aim of forming reference points for businesses, and new inspiring muses, for the practical implementation of new business initiatives. Showcase of the vitality and diversity of businesses in the town, the business park welcomes nearly one hundred companies from all industries: light industrial, business services and individuals. Every year, the Global Entrepreneurship Congress gathers together thousands of entrepreneurs, investors, researchers, policymakers and other startup champions from more than 160 countries to identify new ways of helping founders start, and scale new ventures, around the world. 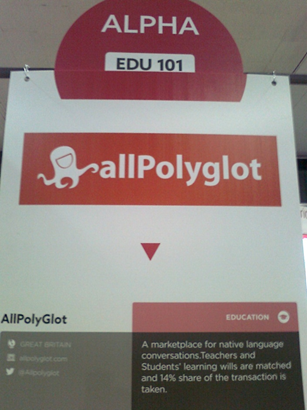 The main aim of Allpolyglot.org 's team was to obtain contacts with investors and visibility. The two founders Davide Ballotta and Enrico Fusto (in the picture) were interviewed by the RAI Radio Televisione Italiana. The interview is available on the Allpolyglot website. Other members of the founding team are Pietro Ballotta and Ivan Capraro. Allpolyglot.org was the only startup interviewed, as being one of the most promising startups present at the event. 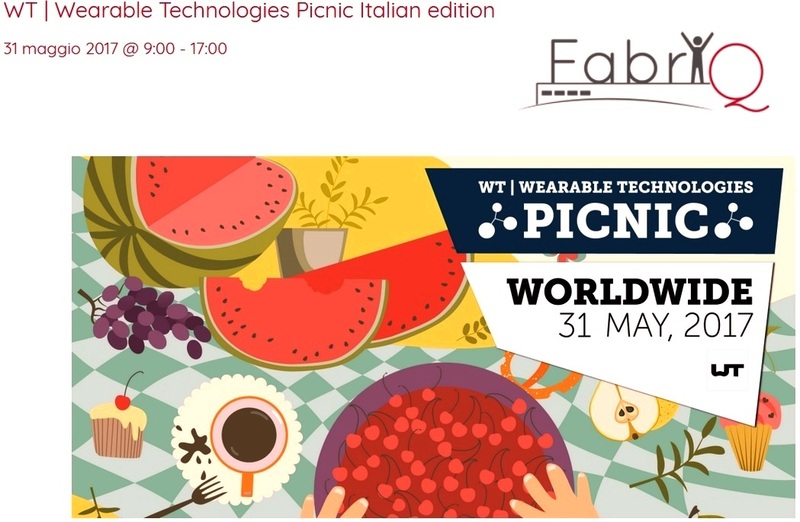 The internet of things and "disruptive" technologies, such as robotics and wearable technologies are revolutionizing the world of industry, including traditional Made in Italy. Creative Thinking Ventures participates in the equity crowdfunding campaign of http://www.toctocbox.com/ on the portal http://www.crowdfundme.it/. The fast and sustainable alternative to traditional shipping methods. TocTocBox is the first collaborative platform that connects those who need to ship with those who travel, to offer an advantageous and reliable service. The foreign languages marketplace https://allpolyglot.org/ presents to investors and investment funds at the headquarters of the Italian financial newspaper Il Sole 24 Ore, at Back to Work 24 #BTW24. 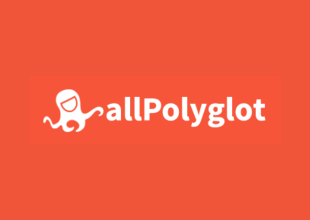 Allpolyglot is a marketplace for “live” Peer 2 Peer foreign language lessons. A web space and platform for sharing with others your personal knowledge of your country, language and culture. 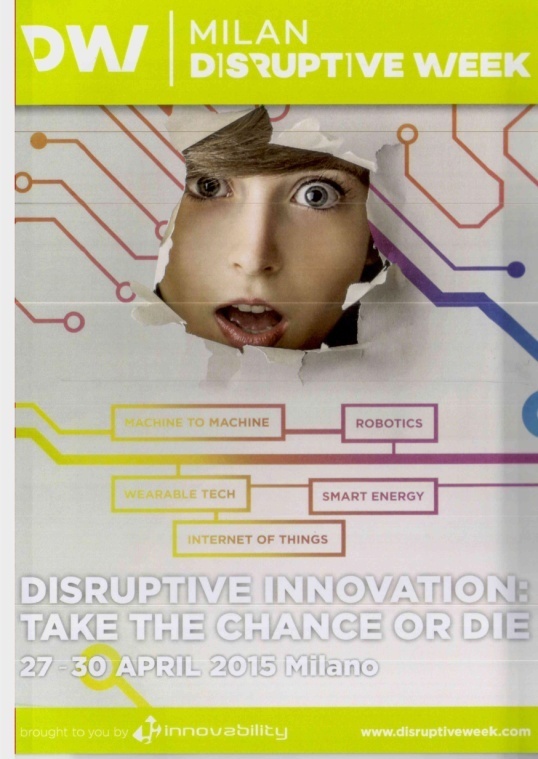 Embrace digital disruption! 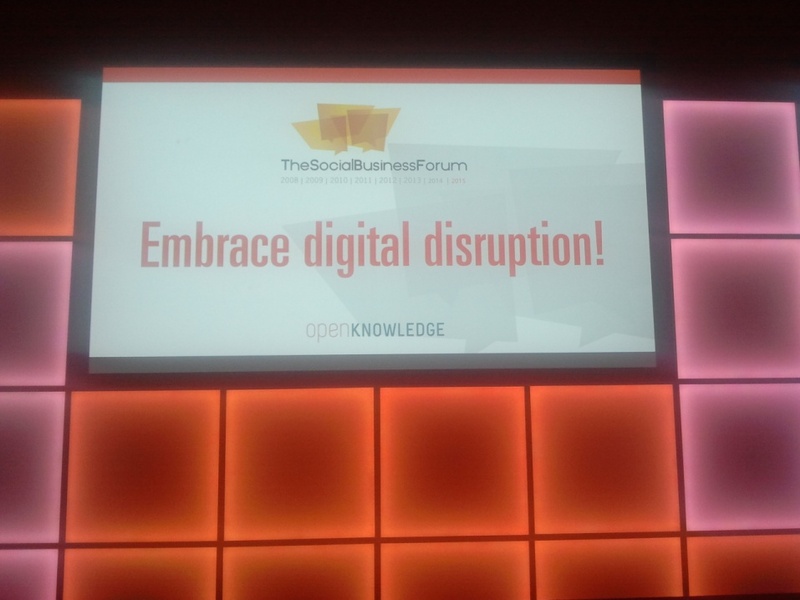 This SBF is the leading forum for social business, and serves to spread awareness about social business and the implications of digital disruption on organizations. To foster discussion and collaboration between practitioners and stakeholders, as well as present and conceive best practices. Sharewood is a vertical community of outdoor and sports enthusiasts. It offers a marketplace for renting the equipment to perform these activities. The founders of and Creative Thinking Ventures reinforce their cooperation and the company becomes a minority reference shareholder, and advisor to the team through our consultancy division GroetConsulting. 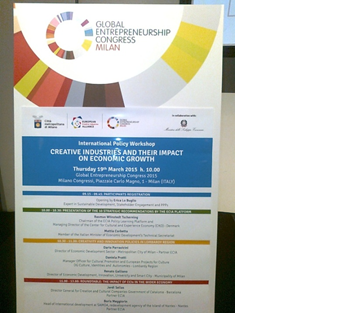 The international event, organized in collaboration with the Italian Ministry of Economic Development, aims to be a meeting point between Italian start-ups, foreign investors, local authorities and agencies specialized in supporting innovative start-ups. During the initiative there are thematic meetings, seminars and conferences, as well as moments of networking and B2B contact between foreign investors and Italian start-ups. Themed around open innovation and the future of digital, with creative insights on the connected consumer, creativity of communications and the internet of everything, the two day innovation festival connects brands and global corporations with disruptive technology to fuel innovation and growth. Worldz is a tool / plugin for ecommerce. It is disrupting the way commerce and retail works, with WOMM (word of mouth marketing). Creative Thinking Ventures is working closely with the team which is based at Talent Garden, and is being accelerated by LAB Creative Thinking. Our consultancy division GroetConsulting is acting as advisor to this promising startup. The startup Allpolyglot.org has been included in the Alpha startups at the WebSunmmit and is present at stand EDU 101 in the Education sector, at "The Village" of the Websummit. Contact with key Venture Capital investors and users, such as potential English teachers and foreign students wanting to use the website to learn, with "live" lessons. Pre-seed investiment and advisory in the language marketplace Allpolyglot.org. An online school and community for English for general purpose and Business English. The startup has grown, originally based in London, it has now moved its HQ to Milan - Italy, and specializes in Peer 2 Peer #P2P English language lessons. Business English, public speaking, presentations, negotiations. Face 2 Face and online.